Silent Hill has Pyramid Head. Outlast has the perpetually smiling Chris Walker, as well as an asylum's worth of other nasty characters. SOMA has whatever the hell these are. Layers of Fear has stacks of books and apples. Not exactly what springs to mind when you think of terror, true. But Layers of Fear adds something more curious to that mundane mix: a ghost that you can confront or completely avoid. The path you choose is up to you and the repercussions of your decisions will impact the world you’re exploring. That's what the creators at developer Bloober Team were going for, though they weren't exactly sure how that would pan out. Playing as a painter slowly losing his sanity as he struggles to complete his magnum opus, you explore a vast mansion looking for eerie art supplies scattered throughout its many rooms, a task made all the more difficult by the fact that the layout of the house changes from one moment to the next (or does it?) and some strange presence haunts the hallways, its intent unknown. Yet, strangely enough, that ghost isn't a threat in the traditional sense - where the Alien in Alien Isolation or the monsters in Amnesia constantly threaten you with a game reset, in Layers of Fear you get to choose whether you deal with the ghost 'chasing' you through the mansion or not. Let it kill you or run away - both are valid options and both add something to the game. "You can run," Lead QA Jacek Zięba,alongside Project Lead Konrad Rekieć clarified for me during a recent playthrough, as I approached an archway made of chairs (mundane objects that become surprisingly creepy just by being stacked up in a weird way). The ghost was clearly on the other side of that arch, but to my right was another, much more sedate looking hallway, and Zięba let me know I could avoid the archway of doom entirely if I wanted to. "'I don't want this, I don't want to see', go back, close the door…If you want to face your fears, if you want the painter to face his fear, this presence, it depends on you. We give you a choice." Like the daring fool I am, I chose the creepy door. The ghost promptly appeared and did something I couldn't make out, but it was definitely unpleasant and I definitely ended up dead. The painter's lifeless body hit the floor, and Rekieć and Zięba responded in tandem: "So after you die…"
And they were right - I was able to get back up, brush myself off, and continue searching for a paint brush made of human hair without any hiccups in my adventure. Yet, whether you deal with the presence or not ultimately changes how the game ends - there are three possible endings - selfish, neutral, and family. The first two are much easier to get than the third, and as of this writing there's still no consensus on how you actually get that family option. But the choices that lead to those ends are, counter to typical horror wisdom, entirely within your control. Of course, not all those choices are as obvious as whether you open the door with the terrifying screaming coming from the other side. In fact, a lot of these moments are subtle and have nothing to do with the ghost; the mansion likes to keep many of them secret, and is rarely willing to give them all up at once. "We think that it would be very difficult for the player to find everything and understand everything during the first playthrough," said Rekieć. "You should figure it out. There are places [where] it's easier to make a choice, and some places are easy to miss. When you find out how the game works, what it requires of the player, what it wants the player to experience…it gets easier for you to find those places." "You need to play several times to get to the bottom layer," added Zięba. Ultimately, I died at least once more during that playthrough, and many more times when I played the game in full on my own - often running straight into the ghost's twitchy arms just to see what would happen. But regardless of my foolish choices, said Zięba, it wasn't their intention to judge my lack of self-preservation. "You never know [if] dying is a bad or good choice. It's your choice." 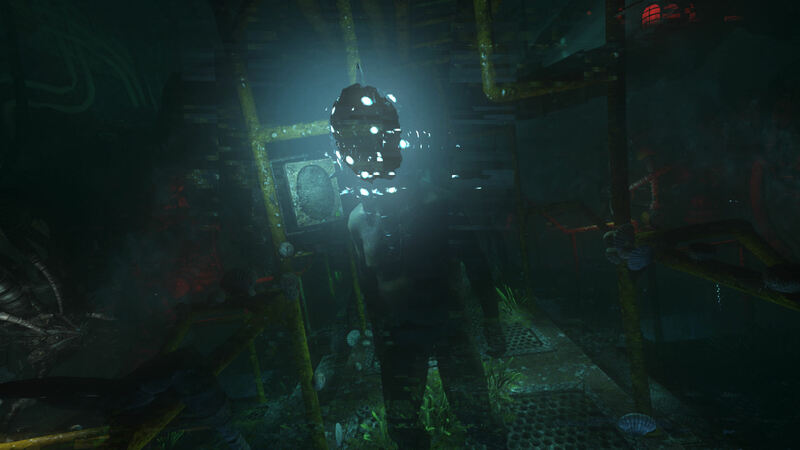 It's easily the most intriguing use of choice that horror gaming has seen in a long while, as it goes out of its way to give you total control where convention dictates you have none. How can a game actually scare you if you can choose, at any time, to take the safe path and avoid all its terrors? Bloober Team's answer is smooth and practiced: the idea of that choice, and where your brave or cowardly choices will lead you, is enough to push people forward. Just as in real life, the choice itself can be more frightening than the fallout. "The good question is if you want to face your fears. If you want to face your fears, of you want the painter to face his fear, this presence, it depends on you," Zięba said.